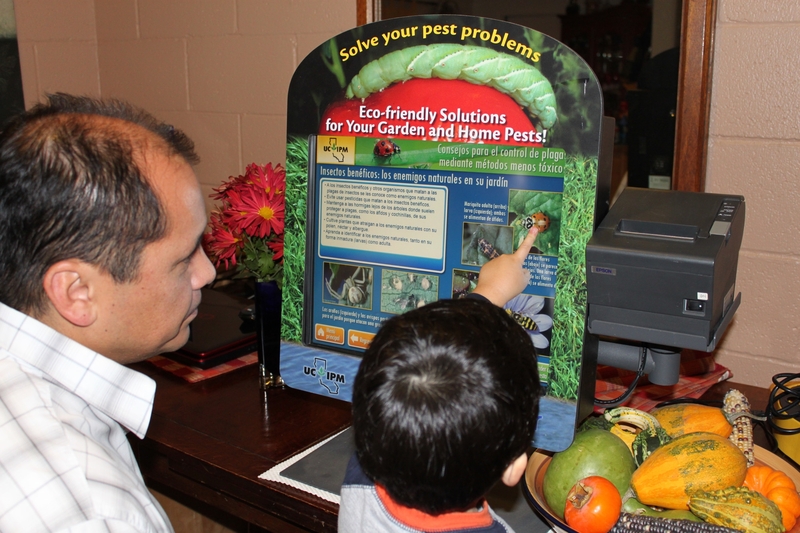 UC IPM Kiosk displaying information in Spanish. Photo by Karey Windbiel-Rojas. National Hispanic Heritage Month (September 15 – October 15) celebrates the contributions, culture, and history of Hispanic and Latino Americans originating from Spain, Mexico, Puerto Rico, Central America, and South America. These Americans make up the largest minority group in the United States and represent a very important part of the UC Statewide IPM Program's audience. In recognition of National Hispanic Heritage Month, we'd like to highlight several important resources available from UC IPM to help Spanish-speaking audiences manage pests and apply pesticides safely. For our Spanish-speaking urban audiences, several short videos on common pests such as ants, spiders, snails, bed bugs, and mosquitoes are available as well as Quick Tips (Notas Breves) offering advice on many pest problems and information on using pesticides safely. There are also 16 touch-screen computer kiosks located in various locations around the state where users can find pest and pesticide information in English or Spanish. For maintenance gardeners preparing to take the California Department of Pesticide Regulation's Pesticide Applicators exam in the category Q, UC IPM offers a study guide and free online training course in Spanish. For agriculture audiences, there are several pesticide safety-related books and DVDs available as well as guidelines for managing strawberry pests. National Hispanic Heritage Month actually originated in 1968 as “Hispanic Heritage Week.” In 1988, it was expanded to an entire month-long event in order to include many important historical events such as the anniversary of independence of Mexico, Chile, and several Central American countries (Belize, Costa Rica, El Salvador, Guatemala, Honduras, and Nicaragua). It ends after Columbus Day. For more on other pest management and pesticide safety information available, please see the UC IPM Web site.